The genus Potentilla in North America has been reexamined taxonomically for work on the Flora of North America. From this, Elven and Murray (2008) consider Potentilla villosa to be of more restricted, coastal distribution in British Columbia than shown in the above map. They say "Potentilla villosa is distinctly coastal with very few records above 50 msm, and it is apparently without a preference for base-rich substrates. The southernmost occurrences are in northwestern Washington, the northernmost in western Alaska south of Seward Peninsula. It is much more restricted in the north than mapped by Hultén...it shows a preference for coastal cliffs. (1968)". Source: Elven, Reider and David Murray. 2008. 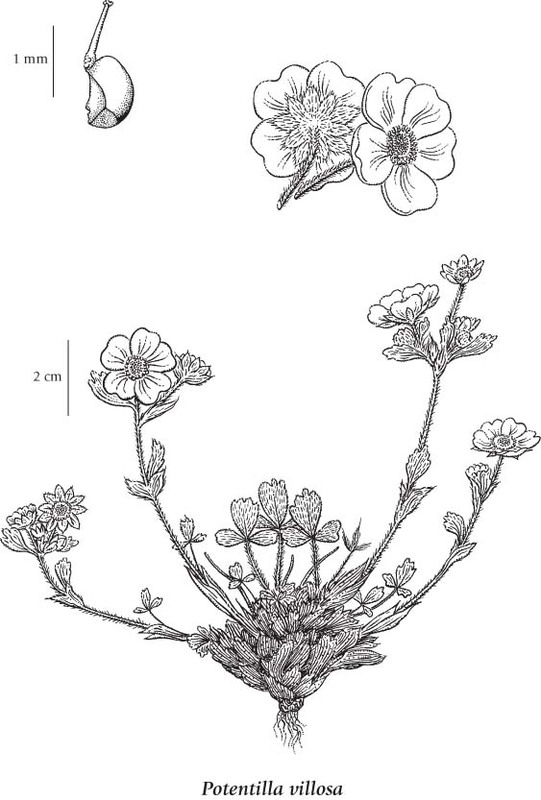 The Potentilla villosa-uniflora group in northwestern North America. Botanical Electronic News #390, March 12, 2008. Perennial herb from a short rhizome and stout branched stem-base covered with dark-brown remains of old leaf-bases; stems several, tufted, ascending to erect, 5-30 cm tall, often branching above the middle, spreading-long-hairy and usually woolly beneath the long hairs, at least above. Basal leaves several, palmately compound, stalked, the stalks long-spreading-hairy and woolly; leaflets 3, rather thick and leathery, broadly egg- to fan-shaped, 0.5-2 cm long, coarsely blunt-toothed on the upper half, greenish and silky to nearly smooth above, greyish-white-woolly and with overlying long silky hairs on the lower surface, the veins usually evident; stem leaves alternate, 1 or 2, nearly unstalked, not much reduced. Inflorescence of 1 to 5, stalked, terminal flowers in fairly open clusters; corollas yellow, bowl-shaped, the petals 5, heart-shaped, 5-12 mm long, shallowly notched at the tip; calyces silky-hairy, 5-lobed, the lobes triangular, 3-7 mm long, alternating with 5 elliptic-oval bractlets about as long as the calyx-lobes; ovaries superior, the styles slightly warty-thickened at the base; stamens usually 20. Achenes, several to many, clustered, lopsided-egg-shaped, 1-2 mm long, smooth or somewhat net-veined. Dry to mesic coastal bluffs, beaches, meadows and rocky slopes in all zones; common throughout all but SC BC, especially along the coast; amphiberingian, N to AK, E to AB and S to WA; E Asia. Potentilla villosa var. parviflora C.L. Hitchc.